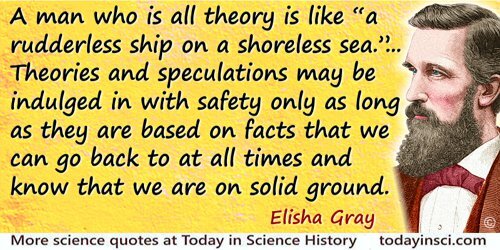 A man who is all theory is like “a rudderless ship on a shoreless sea.” … Theories and speculations may be indulged in with safety only as long as they are based on facts that we can go back to at all times and know that we are on solid ground. In Nature's Miracles: Familiar Talks on Science (1899), Vol. 1, Introduction, vii. As historians, we refuse to allow ourselves these vain speculations which turn on possibilities that, in order to be reduced to actuality, suppose an overturning of the Universe, in which our globe, like a speck of abandoned matter, escapes our vision and is no longer an object worthy of our regard. In order to fix our vision, it is necessary to take it such as it is, to observe well all parts of it, and by indications infer from the present to the past. 'Second Discours: Histoire et Theorie de la Terre', Histoire Naturelle, Ginerale et Particulière, Avec la Description du Cabinet du Roi (1749), Vol. 1, 98-9. Trans. Phillip R. Sloan. Sections and Views Illustrative of Geological Phenomena (1830), iv. His subject is the “Origin of Species,” & not the origin of Organization; & it seems a needless mischief to have opened the latter speculation at all. In a letter to Fannie Wedgwood (13 Mar 1860), in Harriet Martineau's Letters to Fanny Wedgwood (1983), 189. I am a firm believer, that without speculation there is no good and original observation. Letter to A. R. Wallace (22 Dec 1857). In Alfred Russel Wallace and Sir James Marchant (ed. ), Alfred Russel Wallace: Letters and Reminiscences (1916), 109. I am pleased, however, to see the efforts of hypothetical speculation, because by the collisions of different hypotheses, truth may be elicited and science advanced in the end. Letter (5 Sep 1822) to Mr. George F. Hopkins. Collected in The Writings of Thomas Jefferson: Correspondence (1854), Vol. 7, 260. Medicine has been defined to be the art or science of amusing a sick man with frivolous speculations about his disorder, and of tampering ingeniously, till nature either kills or cures him. 'Reflections on the Discovery of the Tau Lepton', Nobel Lecture (8 Dec 1995). 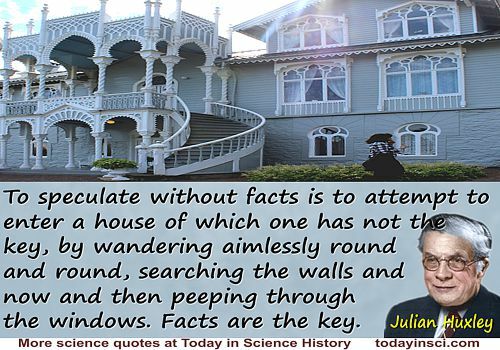 In Nobel Lectures: Physics 1991-1995 (1997), 193. 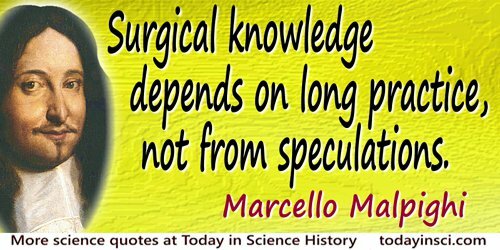 Science is a speculative enterprise. The validity of a new idea and the significance of a new experimental finding are to be measured by the consequences—consequences in terms of other ideas and other experiments. Thus conceived, science is not a quest for certainty; it is rather a quest which is successful only to the degree that it is continuous. In Science and Common Sense (1951), 25-26. 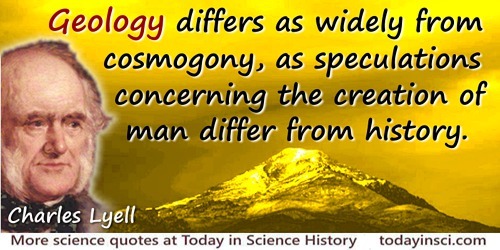 Science, philosophy, religion and art are forms of knowledge. The method of science is experiment; the method of philosophy is speculation; the method of religion and art is moral or esthetic emotional inspiration. Speculations apparently the most unprofitable have almost invariably been those from which the greatest practical applications have emanated. In Dionysius Lardner (ed. ), Cabinet Cyclopaedia, Vol 1, Preliminary Discourse on the Study of Natural Philosophy (1831), 11. 'Letter to Borghese' (27 Jul 1689), quoted in H.B. Adelmann (ed. ), The Correspondence of Marcello Malpighi (1975), Vol. 4, 1486. The ordinary man (or woman) thinks he knows what time is but cannot say. The learned man, physicist or philosopher, is not sure he knows but is ready to write volumes on the subject of his speculation and ignorance. In Revolution in Time: Clocks and the Making of the Modern World (1983), 1. To cosmologists that [the universe is expanding] is the most amazing scientific discovery ever made. … It’s an audacious quest that is unparalleled in human inquiry. … We have entered what once was the ethereal realm only of speculative philosophers. Referring to speculations (on “Not as We Know It” alien lifeforms) made in the total absence of evidence. In 'Fifty Million Big Brothers', The Magazine of Fantasy and Science Fiction (Nov 1978), 55, No. 5, 86. Why speculate when you can calculate? Aphorism mentioned in Australian Federal Court, 1991 Federal Court Reports (1992), Vol. 31, 378. 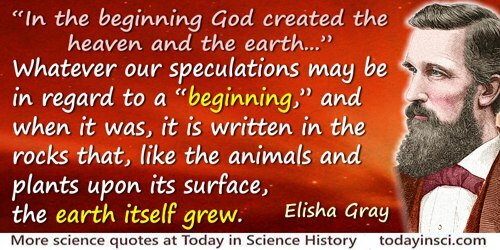 “In the beginning God created the heaven and the earth…” Whatever our speculations may be in regard to a “beginning,” and when it was, it is written in the rocks that, like the animals and plants upon its surface, the earth itself grew. In Nature's Miracles: Familiar Talks on Science (1899), Vol. 1, 1.